« Go NEW YORK Giants! So today was pretty much hurry up and wait. Up at 545, home at 5pm. We had a different lecture each hour on the hour of the morning tha lasted a half an hour. I think we covered about 2 1/2 to 3 hours of material. But hey, that is OK. I am trying to just sit back and follow the group. I think that is the therapeutic approach and maybe something I need to learn, just sit back and enjoy the ride. I wasnt in a rush all day, even with all the miscues, or problems I wont go into here. Because after all, hurrying up wont get me home faster. October/November comes when it does. Still 250+ days to go. 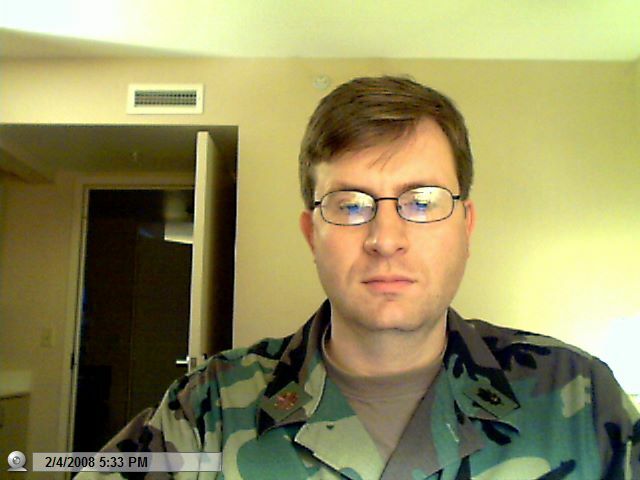 I inserted the picture Day 1 from my webcam. Maybe I will do the daily picture like some people do as something to keep me entertained. I wonder how much I will be able to tell from other than when I got a haircut. This entry was posted on 4 February 2008 at 5:58 pm and is filed under Deployment. You can follow any responses to this entry through the RSS 2.0 feed. You can leave a response, or trackback from your own site. BTW the link below isn’t working for me. Yeah, you should take a picture every day. Maybe we could do a time lapse movie when you get back. my vote is , yes. Definetely do the picture thing. Are you going to have any kind of contact when you’re over there?? Hey congratulations on the new life in your family. We didn’t know Elizabeth was expecting! We are so happy. I just called my Mom and told her. She said to say hi to you when I wrote. Our prayers are with you Brian. Stay safe. We love you.